Stephen Williamson: New Monetarist Economics: What is the Treasury Up To? As I pointed out here, the QE2 Treasury security purchases by the Fed have actually had little effect on the stock of outside money, principally because there have been large inflows into the Treasury's General Account at the Fed. That continues to be the case. The first chart shows securities held outright by the Fed. According to plan, the Fed's stock of securities has increased about $122 billion since the QE2 program began in November 2010. 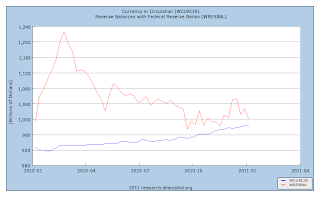 However, in the next chart, we see modest increases in currency and reserves. 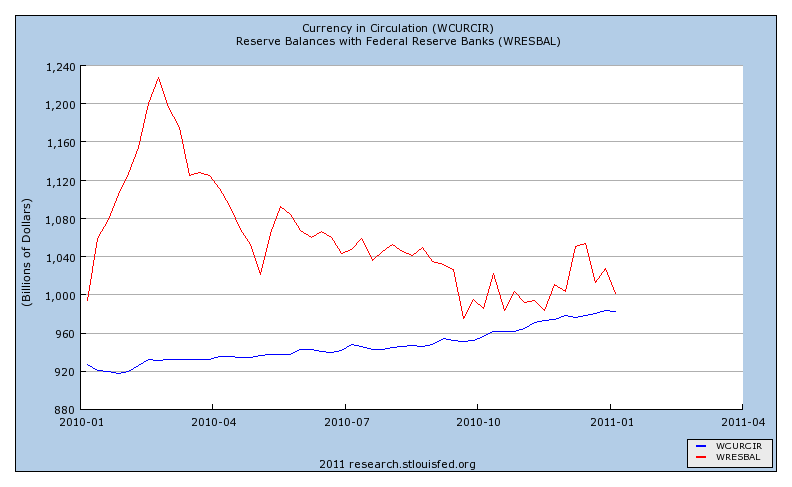 Since early November, the increase in currency is about $18 billion, and in reserves only about $10 billion. The next chart, however, shows that the Treasury accumulated $81 billion in its General Account over the same period. In its General Account and Supplementary Financing Account with the Fed, the Treasury now holds a total of about $315 billion. As one commenter suggested, perhaps what is going on is that the Treasury is hoarding cash in anticipation of a showdown over the federal debt limit, which seems as plausible as anything. In any event, if you thought that some of the effects of QE2 might come through effects on the stock of outside money (e.g. increases in the currency stock as banks dump the extra reserves), there is not that much of that happening. I have a problem with the hoarding explanation. When the Treasury issues bonds, the funds raised accumulate in "Treasury Tax & Loan" accounts. These TTL accounts are the accounts the Treasury holds at large commercial banks. As long as the Fed doesn't transfer these funds to its general account at the Fed, then there will be no movement of reserves from commercial bank reserve accounts at the Fed to the Treasury's general account at the Fed. So even if the Treasury is trying to hoard funds, there is no reason this hoard can't stay in the TTL accounts, thereby ensuring that QE2 proceeds as planned (without sterilization). Put differently, the Treasury can hoard without causing a decrease in bank reserves held at the Fed, as long as it keeps the hoard in the commercial system. But a choice has been made to transfer funds into the Treasury's general account at the Fed. Why? Maybe the Fed is actually worried about inflation and is hoping to sterilize QE2. What they say may be different from what they are doing. Alternatively, maybe the Treasury is planning some very big ticket payments. My understanding is that the Treasury can only spend from its general account at the Fed, not its TTL accounts. To spend funds in TTL, the Treasury must first transfer them to the Fed. Is the Federal government planning on making $100 billion in payments over the next month? If so, they'd want to accumulate this in their Fed account ahead of time ensure their checks don't bounce. 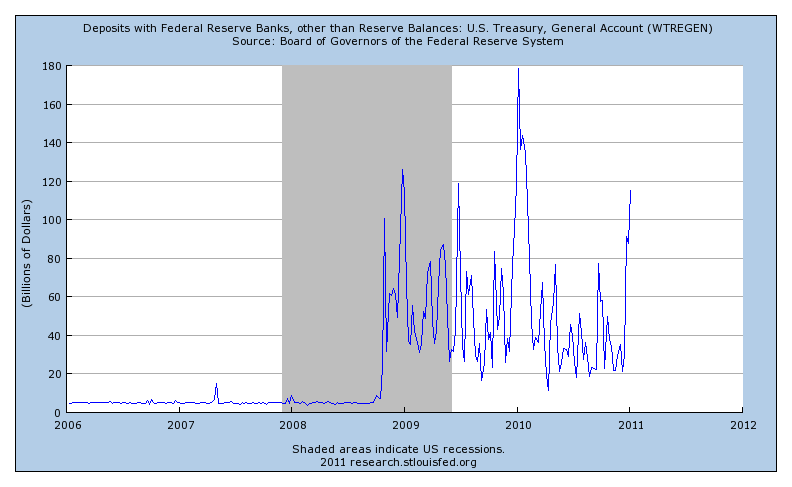 "As long as the Fed doesn't transfer these funds to its general account at the Fed..."
Whoops. The above should read: "As long as the Treasury doesn't transfer these funds to its general account at the Fed..."
Under the circumstances, sterilization makes sense because it reduces the cost of government financing and (not coincidentally) provides a more effective stimulus. Giving banks more reserves will not give them an incentive to lend, nor will it encourage anyone to convert bank deposits into cash. Banks have far more reserves than they need and are constrained by capital, not by liquidity. On the margin, from a bank's point of view, reserves are just a safe asset like T-bills. The special properties that reserves have -- that they can be used to satisfy reserve requirements and settle transactions -- are, on the margin, irrelevant, given that banks have far more than they could conceivably need for those purposes. From the point of view of the public sector, reserves are just another way to borrow: the Fed can borrow by creating bank reserves, or the Treasury can borrow by issuing T-bills. But 3-month T-bills are paying 13 basis points, while reserves are paying 25, so naturally the government prefers to borrow using the cheaper method. This also means that the interest rates earned by the private sector are lower and there is thus more incentive to move out the yield and credit curves and to undertake real investments (or to move nominal investments into foreign currencies, thus weakening the dollar and stimulating the US economy). If banks' marginal assets are held in 13bps T-bills, for example, they have more incentive to lend than if their marginal assets are held in 25bps Fed deposits. In effect, holding Treasury deposits is a way for the Fed to accomplish the same thing that a reduction in the interest rate on reserves would accomplish. I think you have it turned around. What matters is the outstanding debt of the consolidated government (Fed and Treasury). If the Treasury issues $100 billion in T-bills and deposits the proceeds in its account with the Fed, the quantity of reserves held by the private sector falls by $100 billion and the quantity of T-bills rises $100 billion. Everything else unchanged, this would increase the cost of servicing the outstanding debt for the consolidated government. Someone mentioned the TTL accounts in a comment on a previous post, and I still have not understood completely what they are. When the Treasury issues debt, do the proceeds always go into a TTL account? If these are accounts with commercial banks, how does the Treasury determine who gets the deposits? They don't spend out of these accounts, but must transfer the funds first to the general account with the Fed? What's the purpose of the TTL accounts anyway? QE and Treasury market borrowing are independent at the operational level. Therefore, in assessing the cost of Treasury borrowing and surplus balance maintenance, we should assume QE as an independent given. The key questions relate to the timing of Treasury’s borrowing relative to its immediate needs, the external cost of that borrowing, and the alternatives it has in managing any excess balances that result. Furthermore, assuming a decision by Treasury to pre-borrow some of its operating requirements, the economic issue then becomes the net cost to the consolidated interest margin of Treasury and the Fed, given the choice that is available between leaving surplus balances with the commercial banks or transferring them to the Fed. If Treasury borrows and leaves the funds with the commercial banks, reserve levels are unchanged. The incremental interest expense to Treasury is the Treasury bill rate. 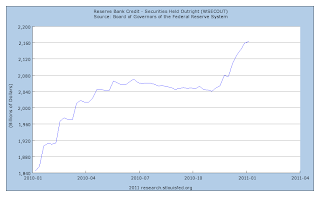 The incremental cost to the Fed is nil, because reserves are unchanged. The only question then is whether Treasury’s external interest expense is offset to any degree by interest it may receive on its balances from the commercial banks. I don’t know the answer to that. If Treasury borrows and transfers funds to the Fed, reserve levels decline by the same amount. The incremental expense to Treasury is still the Treasury bill rate. The incremental benefit to the Fed is the interest it no longer pays on reserves. Any interest it pays to Treasury is a consolidated wash, so we can assume the cost is effectively zero. Therefore, it is clearly a benefit that by transferring cash balances to the Fed, the consolidated operation avoids paying interest to the commercial banks. The only question then is what sort of interest, if any, Treasury would have earned from the banks by leaving its balances with them. E.g. if we assume those balances don’t earn interest (and I don’t know this), the net benefit of transferring the proceeds of treasury bill borrowing to the Fed is the interest the Fed no longer pays on reserves. That’s something like Andy’s conclusion, but not quite the same reasoning. TTL accounts do pay interest. So I doubt there is any real benefit for the consolidated government in transferring funds from TTL accounts to the Treasury's general account at the Fed. No, the general account is currently rising for some other reason than an attempt to cut down on costs. I think they are either trying to sterilize QE2, or they have a big payment they're planning on making in the next few weeks. My understanding is that all taxes go directly into TTL accounts. According to the first paper, funds raised from bond issues went into TTL accounts, but that was in 1979. Nowadays, I think (but am not 100% sure) that funds raised in bond auctions are deposited directly into the Fed's general account. But the Treasury can transfer these funds into its TTL accounts to earn interest. Much of these transfers of Treasury funds back to the commercial system now occur through auction; whichever commercial bank offers to pay the most interest will get the Treasury's deposit. From everything I've read, the Treasury doesn't spend out of its TTL accounts, but only spends out of its general account with the Fed. What's the purpose of the TTL accounts? By pooling up in TTL accounts, funds earned by the Treasury need not immediately flow to the Fed and reduce banks' reserve balances. No need to constantly conduct open market operations to compensate. But I'm sure there are plenty of other reasons. Whether or not the TTL accounts pay interest, the consolidated operation can save money by Treasury pre-funding and putting the funds with the central bank. The net effect as Andy says will be to fund the Fed with lower cost treasury bills instead of higher cost reserves. The question would be which alternative – Fed or TTL - results in a better consolidated margin. The TTL accounts would have to pay a higher rate than 25 basis points for that to be a better alternative. That seems unlikely. Apart from that, there may be an additional, different benefit attributable to pre-funding per se. Treasury may be able to avoid going to market in disruptive circumstances if it happens to hit the debt ceiling before Congress acts. Finally, pre-funding and placing the funds with the Fed, whether or not it is on more favourable terms than leaving the funds in TTL, does reduce bank reserves. This might be construed as a temporary benefit, if the Fed sees the reserve effect of QE as more of a dysfunction than a benefit to the banking system at this stage. Separate from the issue of reserves, QE does have marginal interest rate and broad money supply effects. And banks don’t actually require these reserves in order to lend. Lending depends on the supply of bank capital and customer demand for credit – not on reserves. (The reserve “multiplier” is a bogus concept; “capital multiplier” is closer to the correct idea.) And even if reserves were an issue for lending (which they aren’t) there’d be small rationale to an argument that $ 2 trillion excess is going to do the lending trick any more than $ 1 trillion has already. While a strategy of controlling excess reserve dysfunction would show some insight along these lines, I doubt that’s their reason for pre-funding. But it would be a third potential benefit, albeit temporary, since they’ll eventually use the cash they accumulate by pre-funding for the deficit anyway. What I said in my first comment is obviously not correct, so long as the banks hold the reserves. However, in principle reserves can be withdrawn as currency, and currency clearly bears zero interest (though the costs of printing and maintaining currency are nontrivial but I assume lower than the current T-bill rate). Further, one goal of QE2 seems to be to increase prices, which an increase in currency would produce. Of course, to get the increase in currency, banks have to not be content with the reserve injection, and in line with some of the comments, it's not clear why this would be the case. It matters a lot where the reserves are in the system. If they are concentrated among a few large capital constrained banks they will just be held. I’d also say that just as banks don’t need reserves to lend, they don’t need reserves to satisfy customer demand for currency. When reserve requirements are binding from a system perspective (pre September 2008), excess reserves have the normal functional role of smoothing out payment and settlement operations at the target Fed funds rate. And when reserve requirements are binding from a system perspective, customer demands for currency translate to bank demands for currency, which the Fed then satisfies, with the system reserve effect then being neutralized by Fed OMO. Accordingly, reserves are no more a constraint for currency expansion than they are for lending expansion. It follows that $ 1 trillion or more in excess reserves is not an operational advantage or inducement for currency expansion. "The TTL accounts would have to pay a higher rate than 25 basis points for that to be a better alternative. That seems unlikely." You're giving the Fed/Treasury a free ride, and those don't exist (very often). Banks can get funding at TTL auctions, or they can raise funds in repo markets. Repo rates (in particular the MBS repo rate) have run between 0.2% and 0.3% in 2010. TTL rates have probably approximated this, for if they were below, banks would arbitrage the difference, and if they were above, they wouldn't submit bids. 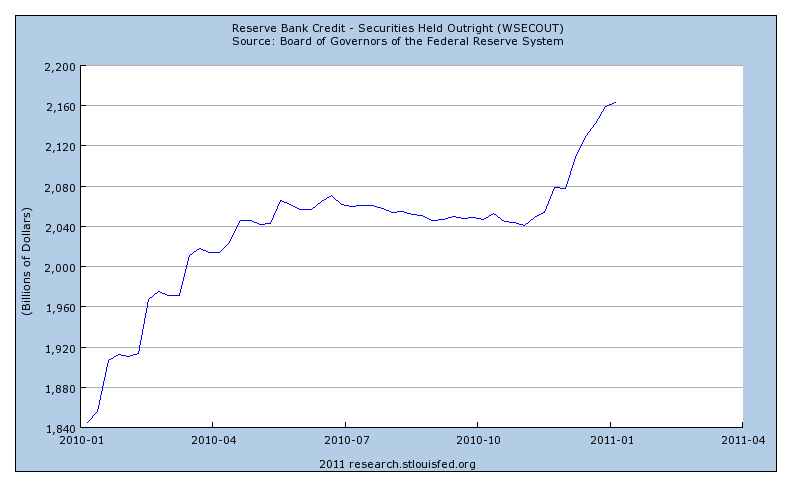 The Fed's interest rate on reserves is 0.25%, within the MBS repo range. So I still don't see any significant financial advantage to keeping the hoard at the Fed. "Whether or not the TTL accounts pay interest, the consolidated operation can save money by Treasury pre-funding and putting the funds with the central bank." If reserves currently have no impact on currency expansion/lending expansion, then I guess you'd say that "safety valve" programs like the supplementary financing program, which purport to drain reserves, are entirely unnecessary. "I’d also say that just as banks don’t need reserves to lend, they don’t need reserves to satisfy customer demand for currency." I think what you are saying is that, in normal times, changes in the demand for currency are accommodated by the open market operations required to hit the fed funds target. Of course we're not in normal times now. Effectively, the overnight rate is determined by the interest rate on reserves, and then the overnight demand for reserves and the demand for currency determine how the outstanding stock of outside money gets split between currency and reserves. The questions then are: (i) Given the interest rate on reserves, could a swap of reserves for long-maturity Treasuries lead to an increase in the the quantity of currency? (ii) How would it make a difference if the swap was T-bills for long-maturity Treasuries? Yes. Although I would say that the relationship between the level of reserves and the level of currency in normal times provides little guidance for what the relationship should be now. The normal relationship in the case of the US, in its order of magnitude, is close enough to that of Canada’s zero reserve requirement system as to suggest that there is very little relationship, IMO. Therefore, we have little guidance based on experience as to what to expect in terms of the ultimate reserve/currency mix when there are $ 1 trillion in excess reserves. It does make sense to think of currency, bank money (deposits), treasury bills, and treasury bonds as a liquidity continuum. Swapping reserves for Treasuries indicates a demand for (even more) liquidity by Treasury sellers, and reallocating some of that increased liquidity to currency makes some sense in terms of portfolio rebalancing. Similarly, swapping T-bills for Treasuries is a move to greater liquidity, and the same logic should hold. But my instinct is that the sensitivity of this rebalancing tendency toward currency is not very pronounced. Those who sell into various QE programs are primarily institutions rather than households. Those institutions will tend to view increased money balances as a risk free store of value (free(er) of interest rate risk), as much as anything, at least temporarily. It’s not clear to me how much of this money eventually moves out to households, where a demand for currency in the mix of transactional liquidity might be a greater factor. Yes, very good. I'm pretty much in agreement. As you say, there's not likely much direct substitution between currency and other assets. However, the adjustment can take place indirectly. In fact, suppose for simplicity that the demand for currency is fixed in real terms. Given the interest rate on reserves, suppose that the demand for reserves falls, for whatever reason. Now, something has to give. 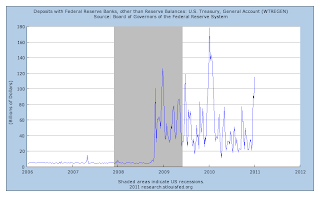 It can't be the interest rate on reserves, as that is determined by the Fed. Maybe some other asset prices change, but one thing that can give is the price level. If the price level rises, people are willing to hold more currency, in nominal terms. In equilibrium, reserves have decreased, and currency has increased, but people are still holding the same real quantity of currency. Now, the question is whether QE2 could increase the supply of reserves relative to the demand. It's just an asset swap, so it's not clear why this would be the case.